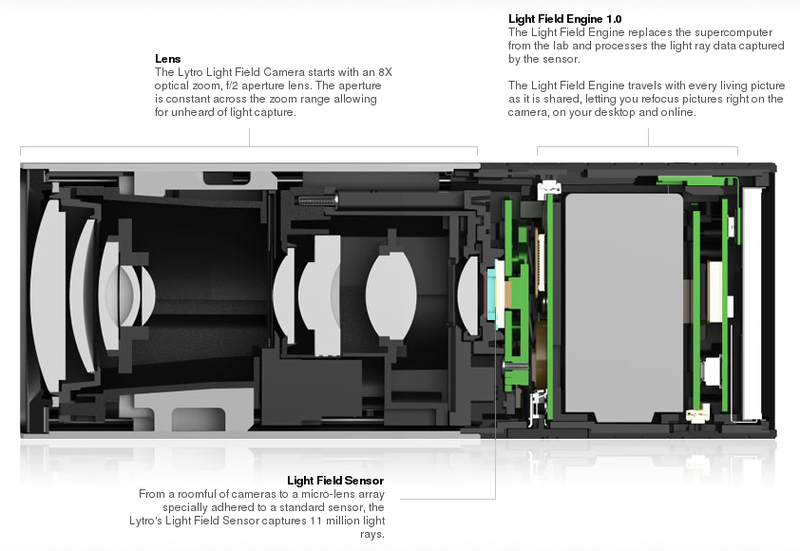 Lytro, a new startup based in Silicon Valley and run by Stanford grad Ren Ng, made news back in July when they announced that they would soon be announcing a commercially viable plenoptic (aka "light field") camera. I'll refer you to my other article for details on how the technology works. In short, it records enough information in a single frame to allow you to adjust the focus point and aperture after the fact, as well as produce 3D images from a single click. I opined back then that while the technology sounded cool, it would definitely be relegated to the consumer market. Physical limitations of the light field technology make it undesirable (or unreasonably expensive) for professional print photographers. It looks like I was right on target. Lytro's new offerings, available for pre-order now and shipping in early 2012, are more reminiscent of a pocket flashlight than a traditional camera. The rectangular, aluminum shape is about 4.4" long and 1.6" square. Two models (three colors) are available, with the larger one having 16GB of internal storage (enough for 750 photos) and costing $500. The lens has an 8X optical zoom and a constant f/2 aperture. The camera features a small, touch-screen LCD on the end opposite the lens that employs the same swiping and tapping mechanism that smart phone users have come to expect. Other than that, the only other controls are the shutter button and the zoom slider. Apple would be proud of such simplicity of both function and design. This camera "point and shoot" taken to an extreme. Once the images have been downloaded to your computer, proprietary software lets you play around with the focus, aperture, and 3D views. This sort of flexibility is where Lytro gets their "living pictures" tag line. If you want to share these living pictures with other folks who don't own one of these cameras (and hence the viewing software) themselves, you can upload the images to Lytro's web servers, from which you can share them with anyone through Lytro's web app. In fact, sharing living images via the web is what this camera is all about. Making traditional prints is not just an afterthought, it's downright impractical. The Lytro cameras record 11 "megarays," which is analogous to 11MP on a traditional sensor. However, the ability to do all that super-cool "living picture" stuff eats a whole lot of sensor photosites for each displayable pixel. If you assume a rather generous 9 photosites per pixel (it's probably more; Lytro won't say), that would result in a traditional image of about 1.2 megapixels. That's a square image of roughly 1100 pixels per side, which could produce a high quality print just 4" square. Is the lack of printing capability really a big deal? Some would say not. Our culture relies more and more on online communication every day. Most people print no more than a small handful of snapshots per year, and 4" is big enough for a scrapbook or bulletin board. 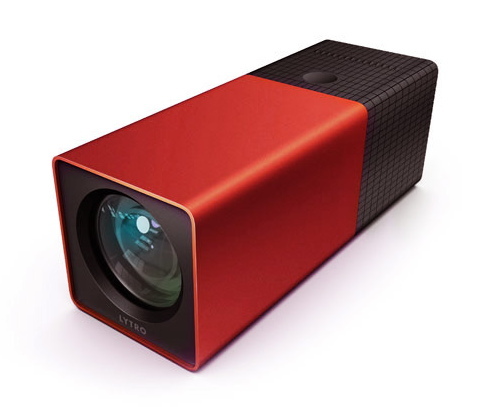 Lytro is banking on online sharing being the wave of the future, and they're probably right. Below is an example living image, directly from Lytro's own gallery. It was taken by Jason Bradley and entitled "Down the Neck." Click around inside the image to refocus it. 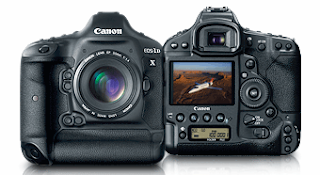 The full specs are available on Canon's web site. Canon reports that this will be a consolidation of both the 1D and 1Ds lines. To me, the most interesting feature is the reduction in sensor resolution. The current 1Ds mkIII boasts 21 MP, while the 1D mkIV (an APS-H / 1.3X crop sensor) provides 16 MP. Canon has always had the mindset that more pixels was always better. In good light, this is true. Nikon, by comparison, was willing to sacrifice a few pixels in order to improve low light image quality. It's looking like Canon is finally taking a cue from their competitor after getting trounced by Nikon in the high-ISO wars for the last few years. I actually discussed this issue in a previous blog post. Time will tell whether the real world performance makes the upper ISO settings usable. I can't wait for somebody to get their hands on one and run some tests against the Nikon D3. Personally, I think Canon did well to consolidate their two 1D lines. The 1DX body is most definitely a sports shooters dream, tailored for fast shooting in low light conditions. I just hope their AF system works well (Canon has had issues there in the past) and that the high ISO is clean. Read the press release here. They're supposed to start shipping in March 2012 at an expected (but unannounced) price of $7000 (the same as their current 1Ds mkIII). Rumor has it that Nikon and Canon are both scheduled to make more press releases next month, so things could get fun for the Christmas buying season. The 5D mkII is now the oldest body in Canon's lineup, at 2.5 years. Could it be time for a 5D mkIII? If so, will they follow the same trend and lower the ISO from the mkII's 21MP, or will they cater to wedding shooters wanting large prints and bump the resolution up even higher? As always, if you have any comments you'd like to make on the subject, or if you hear any juicy new tips on this equipment, please speak up in the comments section below. Oh, and the images on this post came from the respective manufacturers, not from my camera.